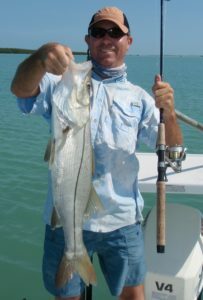 I was poling and sight-fishing a mangrove bank in Flamingo with clients one afternoon, when I saw a gorgeous snook idly swimming just over a cast-length from the bow of the boat. My heartbeat increased immediately and I ducked down so that my profile would not spook the fish or make it uneasy. I quietly poled a few strokes toward the fish and whispered, “Eleven o’clock at 25 feet!”. The angler on the port side of the boat laid a perfect cast a few feet in front of the cruising fish with a Gambler Flappin’ Shad. The snook exploded from where it sat, slammed the bait and the fight was on! It took a screaming run, blazing full speed, parallel to the shore. In between runs, my client would gain line, only to have it peel more out. “Keep it out of the trees!”, I exclaimed. 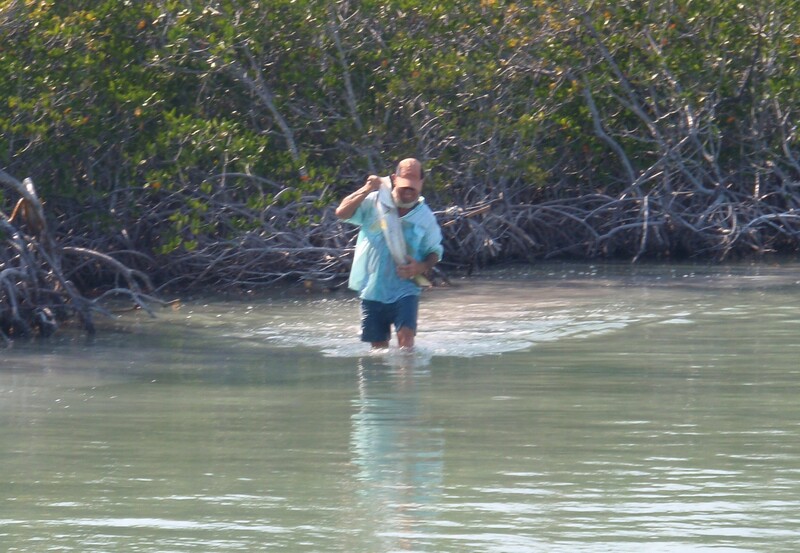 Seconds later, the fish took the line around some mangrove roots and shot further along the bank. Now the snook was hooked on the rod and the trees and struggling up near the bank. 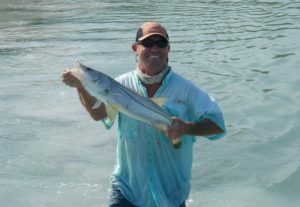 The angler was from Atlanta and had never even seen, let alone caught a snook in his life. I laid my Stiffy push-pole on the deck and jumped overboard into the water. Notice the rod in the trees above my left shoulder. The water was about waist high, but thankfully the bottom was firm. The angler handed me the rod at my urgent request and I began wading towards the bank and the struggling fish. I reeled as I waded toward the trees. As I approached, the fish took even more line and shot behind a another clump of roots, farther up the bank. When I got to the mangroves, I realized I was never going to unwind the line from all of those roots. I had to act! 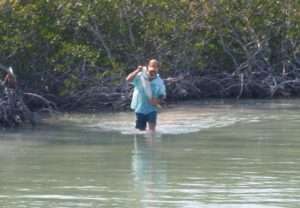 I kept tension on the line and wedged the rod up in the mangrove branches, with the rod tip facing the fish. Then I made a mad, wading dash towards the fish, which was about 20 feet from me. 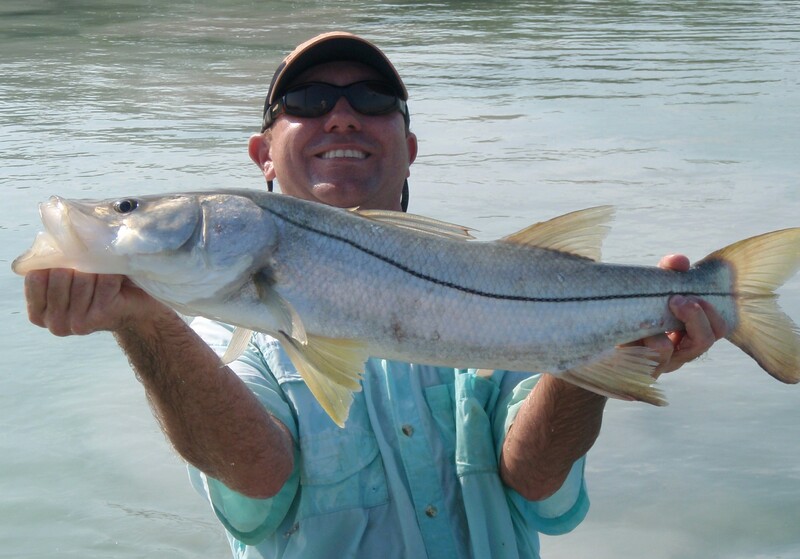 When I got to the snook, I made a lunging grab for its bottom lip. I lucked out and got a grip on it on the first try. It went ballistic! It was splashing and jerking around like mad and I could hardly keep a hold of it. I unhooked the fish, left the rod in the trees and started towards the boat. I waded back to the cheers and celebrations of my anglers. I handed the snook up to my anglers and went back to the mangroves for the fishing combo. I grabbed it out of the tree, untangled it and headed back to the boat. My anglers were ecstatic at what they had seen and they looking forward to telling the story. But the bite was hot, so I got back to poling us along the shore to hunt for more. They each caught a few more fish before packing up and heading home. We went to dinner with a group of their friends that night and I have to admit, I enjoyed the attention I got during the telling of the story. It wasn’t the first (or the last) time that I jumped out of a boat for a fish, but it was the only time that I left the rod in a tree for one!